"Marzetti® Old Fashioned Caramel Dip and sweet apples take classic oat bars from ordinary to extraordinary!" In a large mixing bowl, blend together butter, shortening and sugar with an electric mixer on medium speed until smooth. Add dry mixture and blend to form a crumbly mixture. Measure and set aside 2 cups crumbs. Press remaining crumbs into a 9x13 inch pan. Spread apples into an even layer over crust. Transfer Marzetti Old Fashioned Caramel Dip to a microwave safe bowl and microwave for 30 to 40 seconds or until warm. Stir until smooth. Pour over apples and sprinkle remaining crumbs over all. Bake on middle rack of oven for 25 to 30 minutes or until top is golden brown and apples are tender. 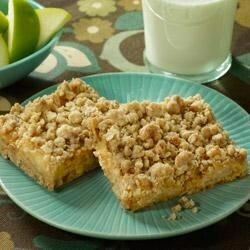 Cut into desired size bars while slightly warm and serve. Store remaining bars covered in refrigerator. This recipe received great compliments from family and co-workers. Everyone wants the recipe. Excellent! I pressed the crust into the pan using a square pan and baked for 10 minutes. Then added the rest of ingredients and baked as directed. Excellent results. I made these for a Halloween party and they were a hit! The only issue I had was that they were very soft so they fell apart easily. Otherwise, very tasty! Delicious and easy! I didn't have premade caramel sauce, so I used the "Oh-So-Easy Caramel Sauce" recipe from this site in its place. I also added a teaspoon of cinnamon to the crumbles. I'm not sure what I did wrong but these were a crumbly mess. Tasted good!